Springtime in Zion National Park is all about renewal. The deciduous trees are putting on leaves, the wildflowers are starting to bloom and the usually dry cliff faces have turned into bases for waterfalls. The best aspect of this scenario is that you can see it up close and personally about three hours from Boulder City. A great way to experience the park, especially if you want a more in-depth understanding of nature and better awareness of your environment, is to take one or more of the workshops that the Zion Canyon Field Institute is offering this spring. In April alone, the institute offers nine such classes. April 10­ — Thursday Trek. Join a naturalist for an introduction to the geology, flora, fauna and cultural history of the park. Hiking is rated as easy to moderate. April 11 — Mojave Wildflowers. Meet up and join the man in the know, botanist Dan McConnell in St. George, Utah, area to find the region’s wildflowers at their best. April 12 — Zion Geology. A short hike and a trailside lecture will show you how geological forces have formed the canyon and are still at work. You will see former landslides and rockfalls and learn about how water continues to reshape the canyon. April 12 — Zion Canyon’s Cottonwood Trees and the CCC. This class focuses on the Civilian Conservation Corps of the 1930s, its work projects along the Virgin River and how they affected the riparian health of the flood plain. April 17 ­— America’s Wilderness: Celebrating 50 Years of Conservation. Garry Oye, National Park Service chief of wilderness stewardship, gives a talk about the 50th anniversary of the signing of the Wilderness Act. April 18 — Zion’s Low Desert Flowers. This is the optimal time to see wildflowers in the extreme southwest corner of the park. Join a botanist for an easy-to-moderate hike to see and learn about this area’s annual wildflowers, prickly cacti and flowering shrubs. 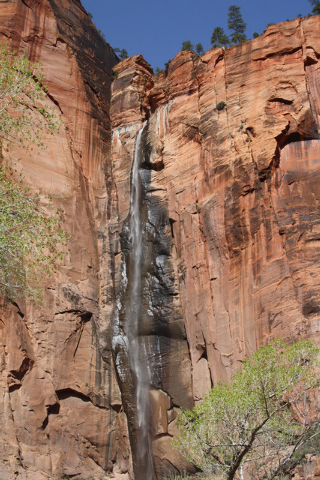 April 19-20 — Zion Through The Lens. Zion Canyon Field Institute Director Michael Plyler, who also is a professional photographer, teaches this unique workshop. Learn about the park while you improve your camera skills in areas such as depth of field, exposure control, filters, tripods and composition. Easy-to-moderate hiking. April 24 — Archaeological Field Day. Learn about Zion and work in the field with an archaeologist. Participants might take part in survey work, cataloging and other tasks. Expect some hiking, hard work and getting dirty. The institute offers workshops and service projects year-round. The workshops are extremely popular and fill up fast, so if you wish to join one, reserve your spot as soon as possible. If your time in Zion isn’t when a workshop takes place, you can take part in their “Custom Explore Zion” program. This program offers half-day or full-day guided activities with a naturalist or guide. To make a reservation for a workshop or a custom exploration, contact the Zion Canyon Field Institute at 800-635-3959, 435-772-3264 or www.zionpark.org. Fees vary depending on workshop and some have minimum age restrictions.